Distributor: R1 DVD and VHS from ADV Films out of print. Notes: Originally released in Japan as two individual OAVs. The two are put together into one video / DVD in the US release. Based on the Sonic video game series by Sega, most notably Sonic 3, Sonic and Knuckles, and Sonic CD. To complete his latest invention, the Hyper Metal Sonic, Dr. Robotnik (Eggman in Japan) lures Sonic and Tails to his robotic metropolis. When Sonic's DNA is later cloned into Hyper Metal Sonic as a result of Robotnik's trap for Sonic, Sonic and Hyper Metal Sonic start fighting like crazy against one another. Even with the aid of the president, his daughter, and Knuckles, Sonic's best friend, will it be enough to save South Island? Considering the lackluster treatments the U.S. gave to Sonic when he went animated (although I thought the childish Adventures of Sonic the Hedgehog was better than the lame, overhyped Saturday morning version, which had about as little to do with Sonic as the Escaflowne and Nadeisco movies had to do with their respective series), you'd figure a Sonic series done by the Japanese, even if it's just two OAVs, would be significantly better than any previous Sonic series. Well, it's some areas it's better, but not by much. The story starts off nice enough, with Sonic and Tails just chilling out on the beach outside their house, enjoying themselves. It feels kin of that of an episode of Adventures of Sonic the Hedgehog, only with Sonic getting annoyed by Tails' antics ("Shut up, Tails!" he says to the fox at one point) insteaf of qupping outdated phrases like "Getta speed, keed", and is the first of many humorous scenes in the OAVs. But then an old owl, apparently friends with Sonic and Tails (where he came from is never explained), has his engine caught on fire, and Sonic and Tails rescue him. The rescue of Old Man does a good job of showing off the speed of Sonic more so than previous animated series have done even (with the possible exception of the opening to Sonic CD). Later on, he even fights against actual Sonic enemies, jumps on springs, and even flies on Tails' Tornado, which is directly taken from Sonic the Hedgehog 2. It's nice to know that , considering the low-budget look and feel of the movie, General Entertainment Co. Ltd. kept true to the Sonic spirit as much as possible, and the Sonic cast look almost exactly like the art from Sonic 3 shows them. The animation is fairly good and the backgrounds are well done, although not very detailed (aside from the obviously New York-based metropolis Robotnik later hunts down Sonic and Tails in). Now, if the story just revolved around Sonic, Tails, and Knuckles hunting down Robotnik and trying to defeat Hyper Metal Sonic, this would have been a great OAV. Sadly, though, the second episode decides to go for a different route: Dragonball Z-like battling between Sonic and Hyper Metal Sonic. You know, where two people are in midair moving really fast, matching the others' moves perfectly (incidentally, Sonic creator Naka Yuji is a big fan of the Dragon Ball franchise). The battle goes for at least a third of the second OAV's duration, and it starts to get old after a while. At least Tails and Knuckles don't get left behind in the process, and the whole second half isn't just about fighting. In fact, the second episode wraps up the series very nicely, and everyone gets their time in the spotlight. Unfortunately, it just wouldn't be an animated adaption of a video game series without adding original characters to the mix. Old Man, the name for the old owl that Sonic and Tails saved in the first episode, is the typical clueless guy with glasses who comes to give Sonic an assignment. He's fairly amusing, but I'm glad that he didn't get much airtime. The other two, however, get far too much time considering the limited role they play. The president of South Island is whiny and overprotective, while his daughter, Sarah, is the obligatory teenage love interest for Sonic. Why she has cat ears and a monkey tail, though, is beyond me: guess an anime isn't an anime without SOME female wearing cat ears. The three characters don't fit well in the Sonic universe at all, and all three could have easily have been cut out / had their roles reduced without affecting the story one bit. The dub doesn't help in an already mediocre work. Tails sounds like he has a cold, Robotnik has an annoying German accent, Old Man sounds like a guy in his 30s imitating an old man (and failing miserably), Knuckles sounds like a cheap knockoff off of U.S. animation voice actor Rob Paulsen, Sonic is whiny, and Sarah..well, she's voiced by a voice actress from ADV. Need I say more? Sadly, it's actually one of the better dubs from ADV's Monster Island recording studio (and their first dub of a kids' anime as well, marking this one of the very few ADV dubs with no swearing). Music isn't anything to write home about, especially the ending song, sung in English by a Japanese girl who is almost impossible to make out. And despite how much you wish for it, you won't hear a single vintage Sonic music clip or sound effect from the video games in the entire series. Lame. 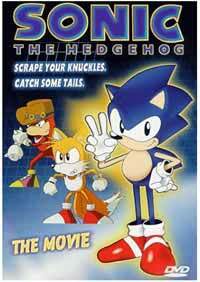 Maybe it's because I'm a Sonic fan, or maybe it was the three year wait from when I first read about this being recently released in a video game magazine in 1996 to it finally arriving in America in 1999, but Sonic the Hedgehog: The Movie isn't as good as it should be. Even if it is more faithful to the video games than the U.S. animated series, has Sonic Team's hand at producing it, and has some very amusing bits here and there, it's too simple and kiddy to be much fun for those not already into Sonic. I know a lot of other Sonic fans who don't like this title much, and I'm not surprised by that. Recommended Audience: Nothing objectionable aside from violence and slapstick, like most children's anime already have. The same audience for Sonic X.